You need a die for two. 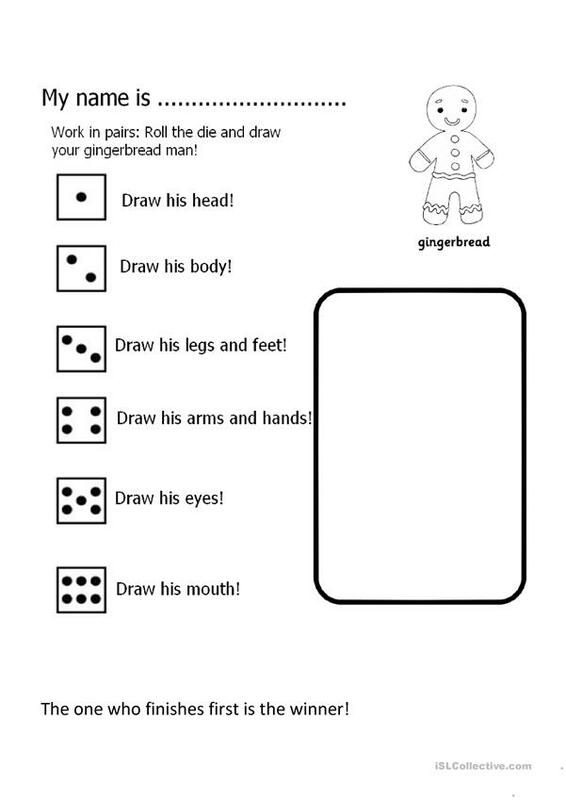 Roll the die in turns and add body parts to make a gingerbread man. The pupil who finishes first is the winner. Reading + voc. This downloadable handout was created for elementary school students and kindergartners and nursery school students at Beginner (pre-A1) and Elementary (A1) level. It was designed for improving your class' Reading skills. Nishy is from/lives in France and has been a member of iSLCollective since 2012-03-24 08:08:10. Nishy last logged in on 2019-03-20 01:06:43, and has shared 3 resources on iSLCollective so far.